Some people like bananas, candy style. Some people don’t. I feel like you either love it or hate it. I am one of the people who loves banana flavored candy. What great packaging. I'm sold. I found this gem when I cruised into the city to meet the fella for lunch. Just so you know, he brought me to this Korean joint where we ate delicious food from the motherland. My motherland. Actually, my motherland for only a few months, but that’s besides the point. I look the part. Despite not getting off at the right stop, and having to get back onto the train, I was still early. I think this was a bit planned. Smart one, that fella. I didn’t walk too far away from our meeting up point, but I did spy a candy shop, Semaru. I had to check it out. I love the packaging. Because of the pretty font. Duh. There was this little pull piece on the front that I have demonstrated in the picture, it’s kind of like peeling the banana. So, now my chocolate banana packaging can be peeled, just like a real banana. So, what does this awesome package hold? A little chocolate covered in a banana flavored hard candy shell. So tasty! 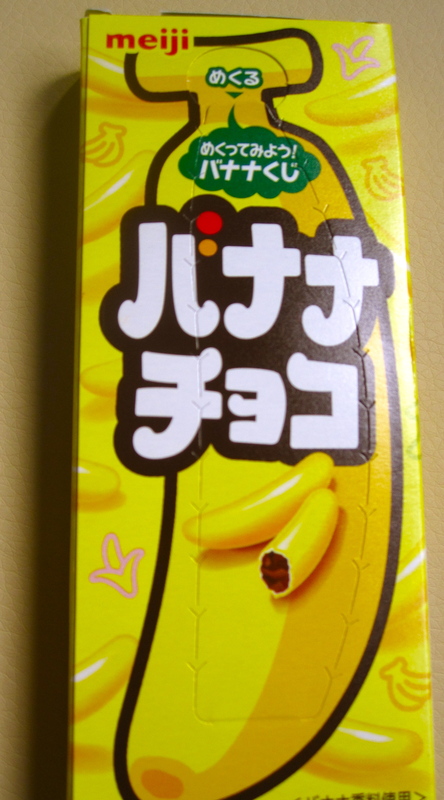 So, if you see this candy where you live, and you love banana flavored candy, pick some up. It’s a good buy, it was only $11.80 HK ($1.50USD). You won’t regret it. Remember how I was lost? What do we always say is the most important thing? Right. I thought you meant of the things we eat.